My Man and I were being nostalgic the other day, talking over the "do you remember whens" . After almost 35 years together, we have a lot of those "remember whens" to talk about. Some were great and fun times and some were not-so-great times with a few tearful ones thrown into the mix. What started all of this remembering was a photo frame I received as a Christmas gift. It has three frames hanging from a plaque that says " Family Memories" on it. I was busy putting photos of his sister and parents and my mom in the frames. These four family members are no longer with us and are very much missed. We talked of some of our childhood memories, My Man and I. He remembers his Mom's baking marathons. Apparantly, she was a night owl and would stay up until the early hours of the morning, baking such yummy treats as homemade eclairs, and chocolate bread. My Mom's baking was done during the day and included an all-day doughnut making spree the week before school started. She made hundreds of doughnuts on that day and froze them for our school lunches. 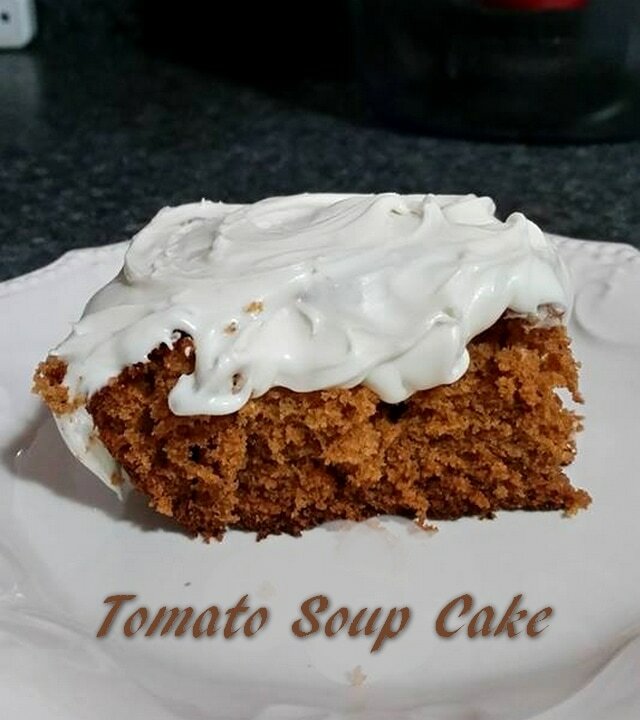 One of the recipes that both of our Mom's had in common was for Tomato Soup Cake. In our house it was one of Mom's go-to recipes (she had several). I have made this cake countless times in my life. I like to serve it and then tell guests what it is. Many of them don't believe it actually has tomato soup in it. Cream butter and sugar together in a mixing bowl. Add egg and beat well. Measure flour, cinnamon, nutmeg, cloves, salt and raisins in a separate bowl. Mix thoroughly. Mix baking soda with the hot water and stir into tomato soup. Add to marg mixture in 2 parts alternately with flour mixture in 3 parts, beginning and ending with flour. Put into a greased 9x13 inch pan. Put all ingredients into mixing bowl. Beat slowly at first to combine then beat at medium speed until light and fluffy. More oe less icing sugar may be added as desired. Makes about 3 1/2 cups.